It's the dawn of a new day in Antarctica as autumn begins in Earth's northern hemisphere. September 23, 1999: Every year about this time thousands of penguins rejoice to see the sun peep above the horizon in Antarctica. The return of the sun after 6 long months of chilly darkness means spring has arrived. For penguins it's time to shed a few pounds of blubber, find a mate, and bask in the sunshine for the next 6 months. For a small band of scientists and technicians who wintered over at the south pole, it's time for supply drops, mail, and fresh fruit. Outside the temperature begins to climb from a frigid -70 deg. C to -25 degrees. Spring is in the air. What triggers this south pole revolution? It's called the autumnal equinox. 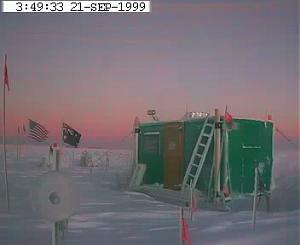 Above: This is an image of the Automated Astrophysical Site-Testing Observatory near the US South Pole Station captured by a web cam just 2 days before 1999 autumnal equinox. The reddish-pink dawn sky presages the coming of a 6 month-long day. Click for images updated every 10 minutes. The autumnal equinox marks the beginning of autumn in the northern hemisphere and spring in the southern hemisphere. This year it takes place at 7:31 am EDT on September 23 when the Sun crosses the equator heading south. On the day of the equinox sunlight and darkness are of almost equal length. At the south pole the sun rises, and at the north pole it sets for six months. Left: The red dot marks the subsolar point (the location on Earth where the Sun is directly overhead) at noon Eastern Standard Time throughout the year. Equinoxes occur when the subsolar point crosses the equator, once in March (the Vernal Equinox) and again in September (the Autumnal Equinox). The subsolar latitude moves around during the year because the Earth's spin axis is tilted 23.5 degrees. If there were no tilt, we would have no appreciable seasons. This animation is based on images generated by by JPL's Solar System Simulator. Every planet in the solar system has seasons. Most have four seasons like the Earth. With the coming of fall for Earth's northern hemisphere our planet joins three others in the solar system where it is also northern autumn: Mars, Saturn, and Uranus. The approximate dates of recent solstices and equinoxes for the other planets are tabulated below. By convention, equinoxes and solstices are named after the corresponding season in the northern hemisphere. When the north pole of a planet is tilted toward the sun, astronomers call it the Summer Solstice; when the south pole is tilted toward the sun it is called the Winter Solstice. Nevertheless, the seasons are opposite in the north and south hemispheres of every planet. When it is summer in New York, it is winter in Sydney. On a spring day in Paris, autumn leaves are falling in Argentina, and so on... In the table, all seasonal references refer to the northern hemisphere. Although fall arrived on Mars nearly two months ago, today is still a special day for the Red Planet because it marks the arrival of a new, weather-monitoring spacecraft from earth. Mars Climate Orbiter, the first of two JPL spacecraft to reach Mars this year, is set to go into orbit around the red planet to become our first interplanetary weather satellite and a communications relay for the Mars Polar Lander, which will arrive at Mars this December. The Orbiter will fire its main engine at about 1:50 a.m. Pacific Daylight Time (spacecraft time) on Thursday, Sept. 23, to slow itself down so that it can be captured in orbit around the planet. "We're interested in what happens during all the seasons of a Mars year. Weather is what happens from day-to-day and the year-long effect of all of that is climate," said Dr. Richard Zurek, project scientist for the Orbiter at JPL. "Mars Climate Orbiter will do what weather satellites do-it will take pictures of clouds, it will look for storms, and it will try to understand the atmospheric winds by measuring temperature and pressure and by watching how the atmospheric distributions of dust and water vapor change with time." Seasons are caused by two factors: axial tilt and variable distance from the sun (orbital eccentricity). Earth's orbit is nearly circular so on our planet axial tilt causes almost all seasonal changes. Mars has the highest orbital eccentricity of any planet except Pluto. Its distance from the Sun varies between 1.64 and 1.36 AU over the martian year. This large variation, combined with an axial tilt greater than Earth's gives rise to seasonal changes far greater than we experience even in Antarctica. From the point of view of an Earth-dweller, one of the strangest effects of seasons on Mars is the change in atmospheric pressure. During winter the global atmospheric pressure on Mars is 25% lower than during summer. This happens because of the eccentricity of Mars's orbit and a complex exchange of carbon dioxide between Mars's dry-ice polar caps and its CO2 atmosphere. Around the summer solstice when the martian north pole is tilted away from the sun, the northern polar cap expands as carbon dioxide in the polar atmosphere freezes. At the other end of the planet the southern polar cap melts, giving CO2 back to the atmosphere. This process reverses half a year later at the winter solstice. At first it might seem that these events occurring at opposite ends of Mars would simply balance out over the course of the martian year, having no net effect on climate. But they don't. That's because Mars is 10% closer to the Sun in winter than it is in summer. At the time of the winter solstice the northern polar cap absorbs more CO2 than the southern polar cap absorbs half a year later. The difference is so great that Mars's atmosphere is noticably thinner during winter. Martian seasons are peculiar by Earth standards, but they probably pale in comparison to seasons on Uranus. Like Earth, the orbit of Uranus is nearly circular so it keeps the same distance from the Sun throughout its long year. But, Uranus's spin axis is tilted by a whopping 82 degrees! This gives rise to extreme 20-year-long seasons and unusual weather. For nearly a quarter of the Uranian year (equal to 84 Earth years), the sun shines directly over each pole, leaving the other half of the planet plunged into a long, dark, frigid winter. Left: A dramatic time-lapse movie by NASA's Hubble Space Telescope shows seasonal changes on Uranus. Once considered one of the blander-looking planets, Uranus is now revealed as a dynamic world with the brightest clouds in the outer Solar System. more info. The Northern Hemisphere of Uranus is just now coming out of the grip of its decades-long winter. As the sunlight reaches some latitudes for the first time in years, it warms the atmosphere and triggers gigantic springtime storms comparable in size to North America with temperatures of 300 degrees below zero. In the animation pictured left the bright clouds are probably made of crystals of methane, which condense as warm bubbles of gas well up from deep in the atmosphere of Uranus. Uranus does not have a solid surface, but is instead a ball of mostly hydrogen and helium. Absorption of red light by methane in the atmosphere gives the planet its cyan color. Uranus was discovered March 13, 1781, by William Herschel. Early visual observers reported Jupiter-like cloud belts on the planet, but when NASA's Voyager 2 flew by in 1986, Uranus appeared as featureless as a cue ball. In the past 13 years, the planet has moved far enough along its orbit for the sun to shine at mid-latitudes in the Northern Hemisphere. By the year 2007, the sun will be shining directly over Uranus' equator. Mercury's seasons -- if they can be called that -- are also remarkable. Until the 1960's it was thought that Mercury's "day" was the same length as its "year" keeping the same face to the Sun much as the Moon does to the Earth. This was shown to be incorrect by doppler radar observations. We now known that Mercury rotates three times during two of its years. Mercury is the only body in the solar system tidally locked into an orbital-to-rotational resonance with a ratio other than 1:1. This fact and the high eccentricity of Mercury's orbit would produce very strange effects for an observer on Mercury's surface. [ref] At some longitudes the observer would see the Sun rise and then gradually increase in apparent size as it slowly moved toward the zenith. At that point the Sun would stop, briefly reverse course, and stop again before resuming its path toward the horizon and decreasing in apparent size. All the while the stars would be moving three times faster across the sky. Observers at other points on Mercury's surface would see different but equally bizarre motions. Temperature variations on Mercury are the most extreme in the solar system ranging from 90 K at night to 700 K during the day. The temperature on Venus is slightly hotter, thanks to the greenhouse effect caused by its carbon dioxide atmosphere, but very stable. Because of Venus's thick cloud cover, seasonal changes in temperature are likely to be small on that planet. Meanwhile, back on Earth, astronomers are preparing to take advantage of the coming Antarctic day to prepare for observing when the sun sets 6 months from now. Although conditions at the South Pole are harsh astronomers are increasingly interested in making observations from Antarctica. The nights are long and the skies are dark. Southern stars are visible above the horizon for 24 hours a day during the winter, and the South Pole is very, very dry. This means that stars don't twinkle much and the atmosphere is exceptionally transparent. In the parlance of astronomy: "Seeing is good." Astronomical instruments at the South Pole include infrared telescopes and sub-millimeter wavelength radio telescopes used to study star formation, cosmic molecular clouds, and cosmology. The newest addition is a radio interferometer called DASI, a University of Chicago instrument designed to probe minute fluctuations in the cosmic microwave background radiation. DASI is currently in Chicago for last minute testing and fine-tuning. After it arrives at the south pole later this austral summer it will begin making observations that could lead to important breakthroughs in our understanding of the early universe and how it has evolved since the Big Bang. It may be the dawn of a new day for penguins, but for polar bears it's time to start thinking about hibernation. As the sun rises at the south pole it sets at the north pole. Pictured right is a vista from Tromso, Norway (69 42' N, 19 00' E) just above the Arctic circle. For the next 6 months the Sun will never be higher than 21 degrees above the horizon, and on December 22 it will be dark for over 24 hours. of twilight in Tromso Norway (69 42' N, 19 00' E) 2 days before the 1999 autumnal equinox. for a live view of Tromso.